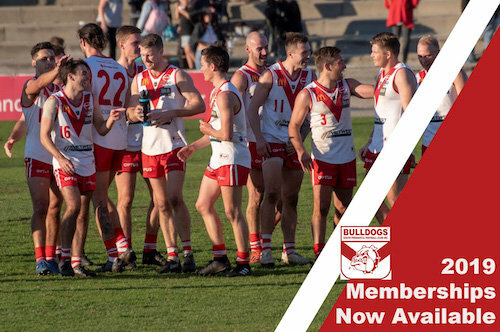 SOUTH Fremantle was again unable to get past the WAFL preliminary final hurdle with West Perth making a flying start and holding off the Bulldogs in the second half to book their place in the 2018 Grand Final. 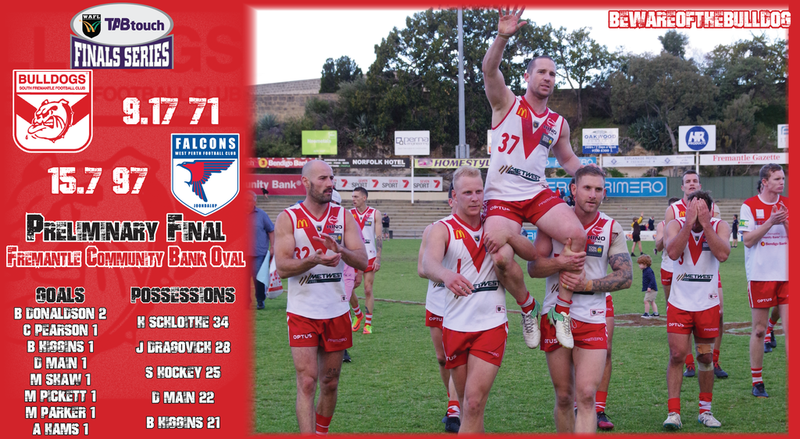 Despite South Fremantle having beaten West Perth the past nine occasions including by 98 points two weeks earlier in the qualifying final, and the Bulldogs entering the preliminary final the warmest of favourites, it was the Falcons who shot out of the blocks. West Perth came out a ferocious, desperate, determined and well-drilled unit at Fremantle Community Bank Oval going on to kick four goals to one in the opening quarter. The Falcons turned up the heat further in the second quarter with some inspired football kicking five goals to one to lead by 41 points at half-time. 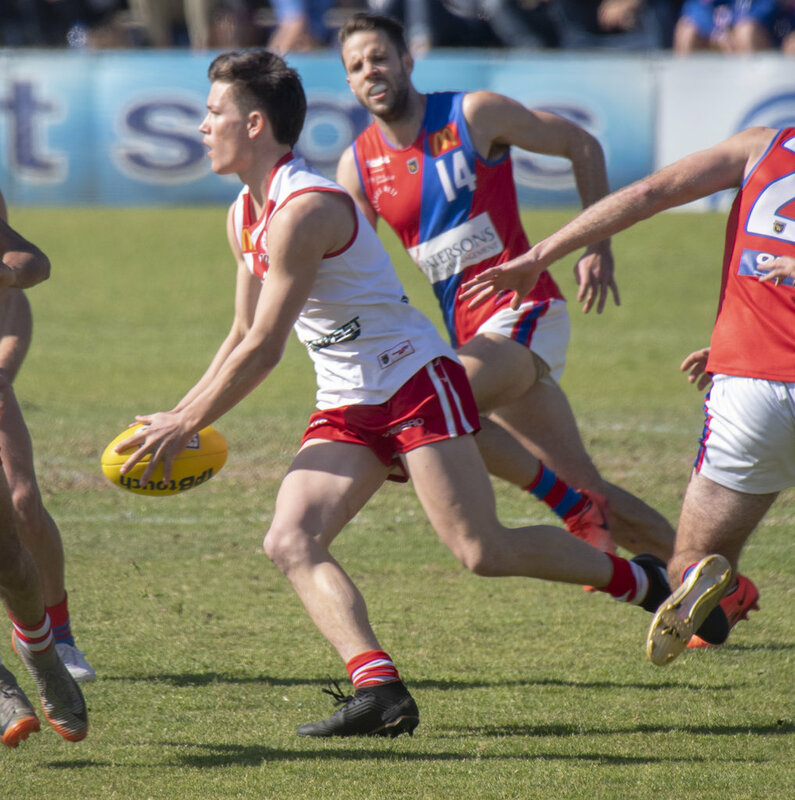 It would take the biggest second half comeback in WAFL finals history for South Fremantle to avoid a third straight preliminary final loss, and the Bulldogs definitely did go up a gear in the second half. The Bulldogs were desperate to find a way back into the game and dominated all areas of the second half except in front of goal. South Fremantle ended up kicking 7.12 for the second half and 3.9 alone in the last quarter to kick themselves out of a comeback. West Perth were clinical in their rarer forays forward in the second half but still kicked six goals after half-time to secure the 15.7 (97) to 9.17 (71) victory. The win means West Perth advances to the 2018 Grand Final next Sunday against Subiaco at Optus Stadium. It is the Falcons first Grand Final appearance since also losing to Subiaco in 2015 as they chase a first premiership since 2013. 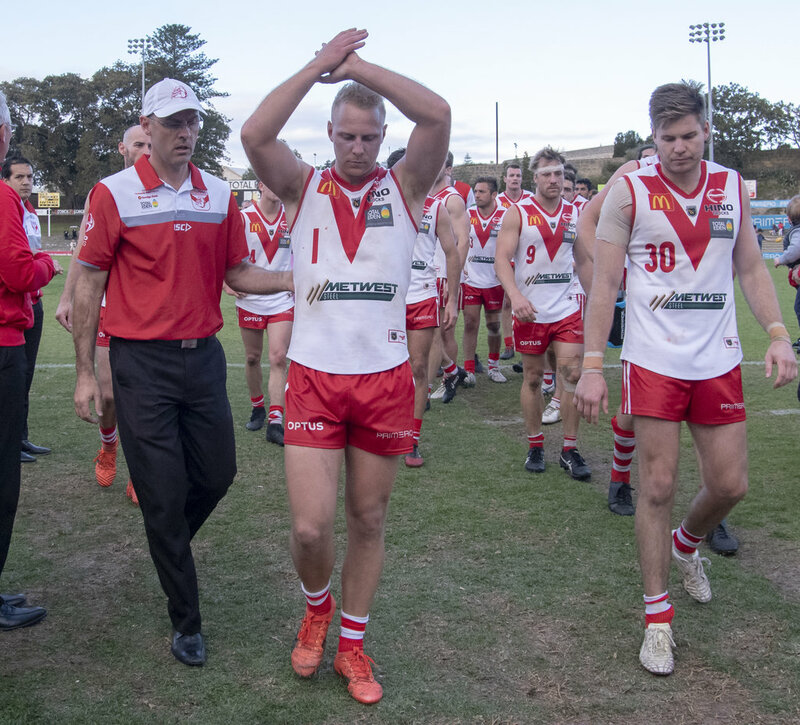 Heartbreakingly for South Fremantle it was a third straight exit in a preliminary final and the loss came despite the Bulldogs finishing the game with 89 more possessions, 35 more marks, four more inside-50 entries and 26 scoring shots to 22 for the game. 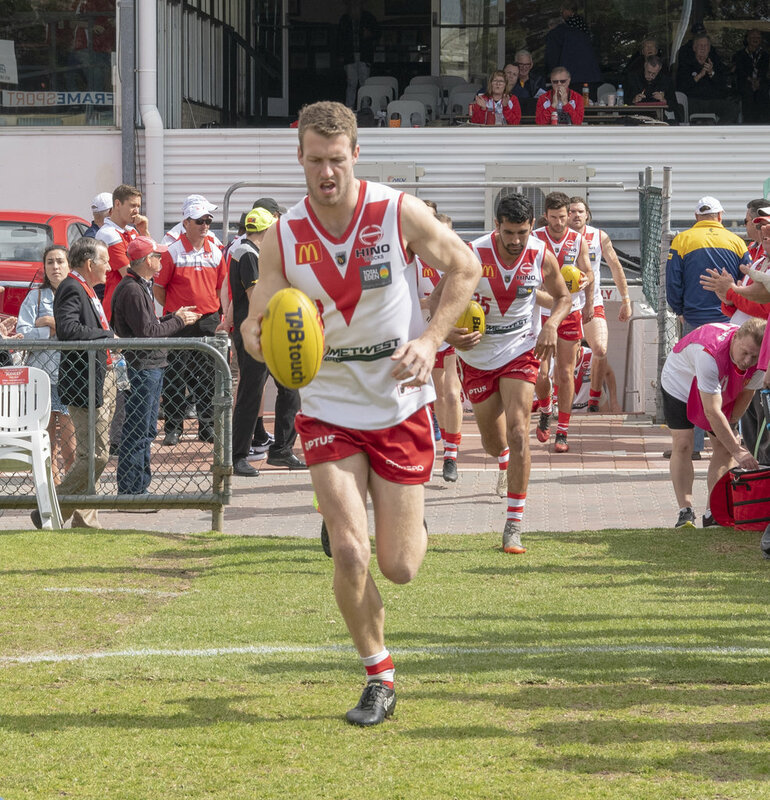 It also spelled the end of a decorated WAFL career for South Fremantle champion Ashton Hams who fittingly kicked the last goal of the game in what will be his last kick. 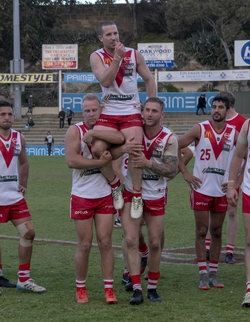 He retires after 205 games with South Fremantle including two premierships, two Simpson Medals, a fairest and best and life membership at the Bulldogs. 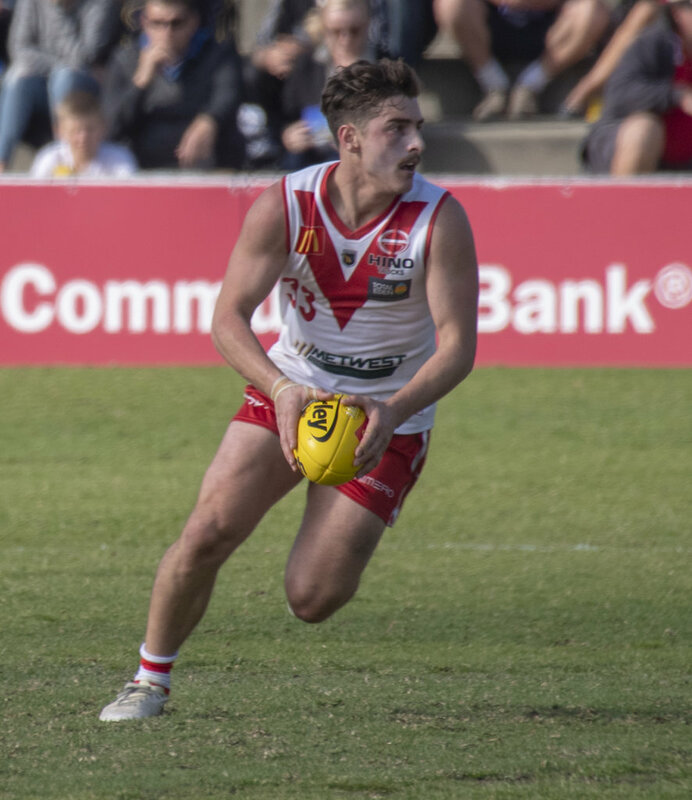 Haiden Schloithe delivered a huge second half for South Fremantle to try to inspire his team and finished the preliminary final with 34 possessions and four tackles. Jacob Dragovich also gathered 28 disposals for the Bulldogs, Shane Hockey 25, Dylan Main 22, Nick Suban 20, Ryan Cook 20, Shaun Bewick 19, Steven Edwards 19 and Jason Maskos 19. Brock Higgins returned from an ankle injury and was a dominant presence with 21 touches, 56 hit outs and a goal while Brandon Donaldson was lively with 20 possessions, eight marks and two goals. Blayne Wilson was strong down back with 20 possessions and seven marks and also did the job on Tyler Keitel after Noah Strom went off injured early. West Perth kicked the opening goal of the preliminary final when ruckman Chris Keunen ran hard to take a diving mark at the top of the goal square. But when South Fremantle skipper Dylan Main marked and goaled up the other end, the stage was set for a terrific contest. But West Perth's intent and ferocious attack on the ball and opposition was at another level with the Falcons going on to kick the last three goals of the first term thanks to Keegan Knott, Tyler Keitel and late inclusion Rudy Riddoch to lead by 19 points at the first change. Another shocking turnover early in the second quarter from South Fremantle's defence saw West Perth captain Aaron Black mark and go back to convert to extend the Falcons' lead to 25 points. The Bulldogs did get a goal back through Mason Shaw, but it was again all the Falcons to close the second quarter with goals to Connor West, Andrew Strijk, Jay van Berlo and Corey Chalmers after the siren. West Perth's lead had ballooned to 41 points in a stunning first half from the Falcons against a rattled Bulldogs who were staring down the barrel of a third straight preliminary final defeat. South Fremantle had to respond to start the second half and they did come out desperate and with a clear left in intensity. That did lead to an early third quarter goal to Brandon Donaldson but they couldn’t take advantage of their dominance in general play. West Perth got the next goal through Strijk before Donaldson did add another for the Bulldogs and Matthew Parker also kicked one from the goal square. That was the first time they had kicked consecutive goals for the game, but West Perth steadied with a great goal from 50m by Blake Wilhelm when he intercepted a South Fremantle pass. 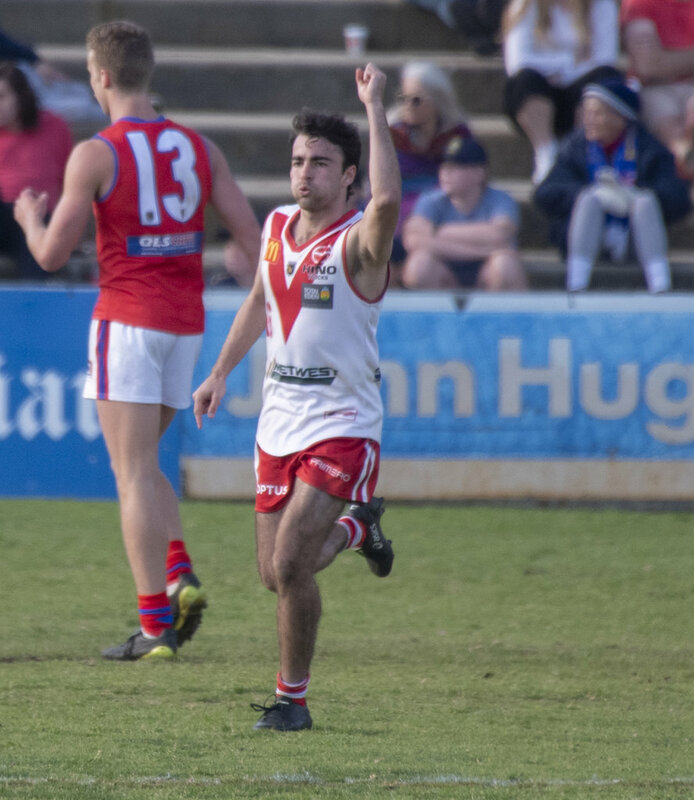 South Fremantle had the better of the quarter but by the time Brock Higgins goaled late, they hadn’t made the inroads they would have hoped with West Perth still up by 29 points at the last change. The Bulldogs threw Marlion Pickett to full-forward in the last quarter and they were creating plenty of chances, but weren’t able to convert that into goals. Pickett did kick a goal at the four-minute mark, but South Fremantle missed a host of gettable chances. It seemed inevitable that West Perth would make them pay and while the Falcons didn’t go forward a lot in the last quarter, seemingly each time they did they scored a goal starting with a beauty from Mitch Peirce. Riddoch also made the most of his chance in the side kicking another and then Strijk showed his class with two more to ensure a 26-point win for West Perth after his good mate Ashton Hams kicked a goal after the siren to mark the end of his 205-game WAFL career. 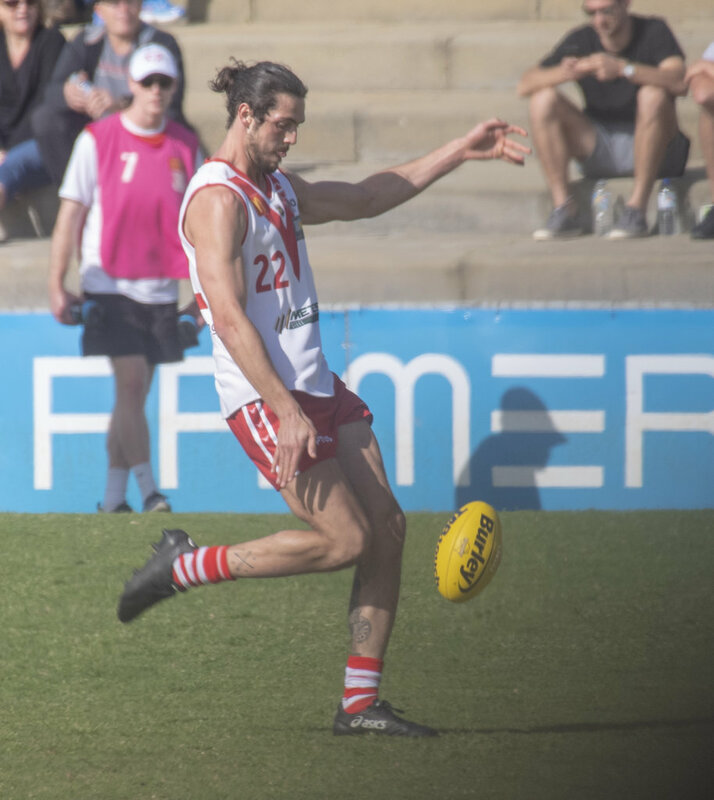 SOUTH FREMANTLE – Goals: Donaldson 2; Pearson, Higgins, Main, Shaw, Pickett, Parker, Hams. Best: Higgins, Schloithe, Wilson, Donaldson, Dragovich, Edwards, Hockey. WEST PERTH – Goals: Strijk 4; Riddoch 2; Black, Chalmers, Wilhelm, van Berlo, Keunen, Peirce, Knott, Keitel, West. 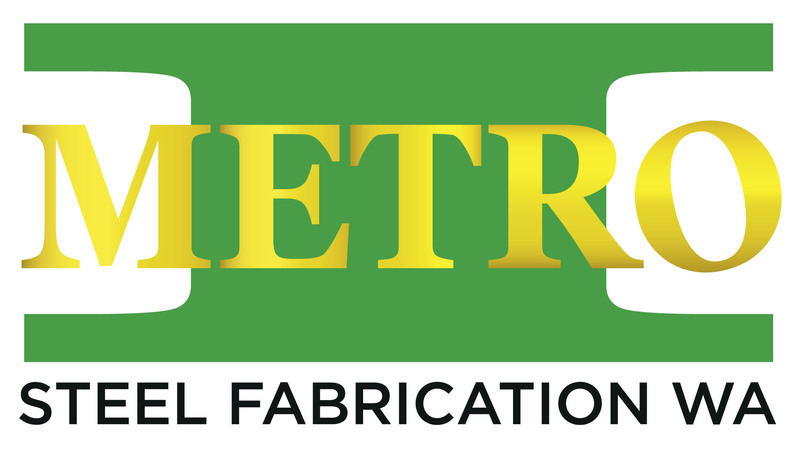 Best: Meadows, Strijk, Black, Peirce, Nelson, Lourey, Guadagnin, Riddoch.